Folks. FOLKS. Are you paying attention? Because if you serve any Percy Jackson fans, YOU NEED THIS. As you may be aware, Rick Riordan has a new imprint with Disney-Hyperion called Rick Riordan Presents. This new imprint is for middle grade series based on world mythology written by own voices authors. YES. GET EXCITED. And I want to let you know that this very first book in the very first series of the new imprint is AWESOME. Aru Shah and the End of Time by Roshani Chokshi. Aru Shah is somewhat of a loner. She lives with her mom in Atlanta in a house connected to the Museum of Ancient Indian Art and Culture, but her mom is gone most of the time on business trips. She tries to make friends with the kids at school, but somehow Aru's active imagination always seems to get in the way. So when three of her classmates show up at the Museum one day, Aru is desperate to impress them... so she tells them about the cursed lamp, the lamp her mother has warned her never to touch. Lighting the lamp awakens an ancient, evil spirit called the Sleeper. And now Aru, a descendent of the legendary Pandava brothers, has nine days to save the world. If you have fans of Percy Jackson in your library or in your life, you're going to want to get this series opener. Fittingly, it is the best readalike for Percy Jackson that I have yet read. The story is full of action and adventure and interpretations of Hindu mythology, but it also has a lot of humor, giving it a tone that feels very much like Percy Jackson. I love that Rick Riordan is using his superstar author status to publish own voices stories and I think these are going to be hits. Aru Shah comes out March 27, so go ahead and get your orders in. You'll want this book on your shelves and you'll want to add it to your booktalks. It's been announced that the next series from Riordan's imprint will be focused on Mayan mythology (The Storm Runner by Jennifer Cervantes is out in September) and Korean mythology (Dragon Pearl by Yoon Ha Lee is out next January). I, for one, can't wait! 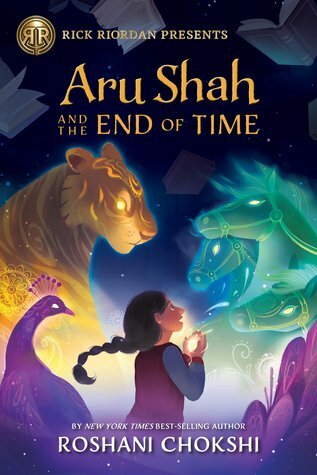 Featured book: Aru Shah and the End of Time by Roshani Chokshi (Grades 4-8.) Disney-Hyperion, March 2017. Reviewed from ARC provided by publisher.